High loads of petroleum hydrocarbons in contaminated soils and sediments make these ecosystems difficult to study with molecular techniques. Among these sites, aquifers – environments with low turnover rates and, hence, slow-growing microbial communities–pose a great challenge for microbial ecologists. Fluorescence produced by petroleum hydrocarbons coating sediment particles can be so strong that microscopic techniques are made impossible. Low microbial cell numbers pose further limitations for molecular analyses such as fluorescence in situ hybridization (FISH). 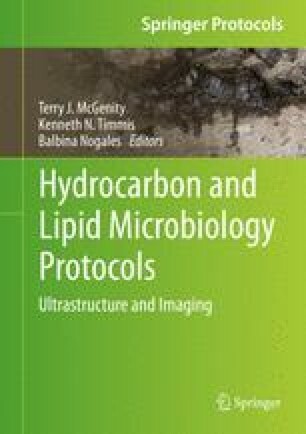 Here, we present a protocol for the separation of microbial cells from sediment samples of highly petroleum-contaminated aquifers. By excluding the strongly autofluorescing sediment particles, by concentrating microbial cells on membrane filters, and by using signal amplification in combination with FISH (CARD-FISH), we were able to quantify various microbial populations in this intriguing ecosystem.